With characteristic erudition and precision of thought, Valerio Valeri took on the conceptual ambitions of anthropology at their most challenging. Any superlative diminishes Valeri and his scholarship, which is characterized by rich, subtle, and complex ethnographic and historical information, underscored by theoretical rigor based on extensive fieldwork. In a period when so many of the classic concepts of anthropology have become the object of suspicion and critique, this outstanding volume demonstrates on the contrary the extraordinary philosophical excitement that can emerge when a master analyst such as Valeri reinvigorates and re-thinks our categories of thought through a series of unprecedented intellectual tour de force beyond anthropology and across the humanities. A powerful argument for the importance of comparison in anthropology, and a moving tribute to one of the truly great theorists. 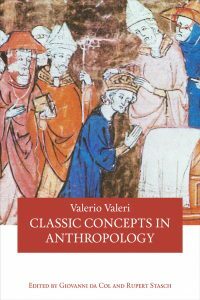 This wonderful volume brings together many of the late Valerio Valeri’s illuminating writings on a wide-range of topics at the heart of anthropology from mourning and the fetish to caste, cultural relativism, and kingship. Throughout the essays–many of which have been translated into English for the first time—speak to the enormous erudition, analytical subtlety, theoretical creativity, and breadth of intellectual curiosity for which the author is so justly remembered.